I don't just want products to look good on the outside anymore. I also want the product to be beneficial for my body and health and I'm not just talking about skin products, I mean hair! I will hold up my hand and admit that I have not been very wise about the hair products I use but lately I have been doing my research and finding out what keeps your hair healthy and shiny. 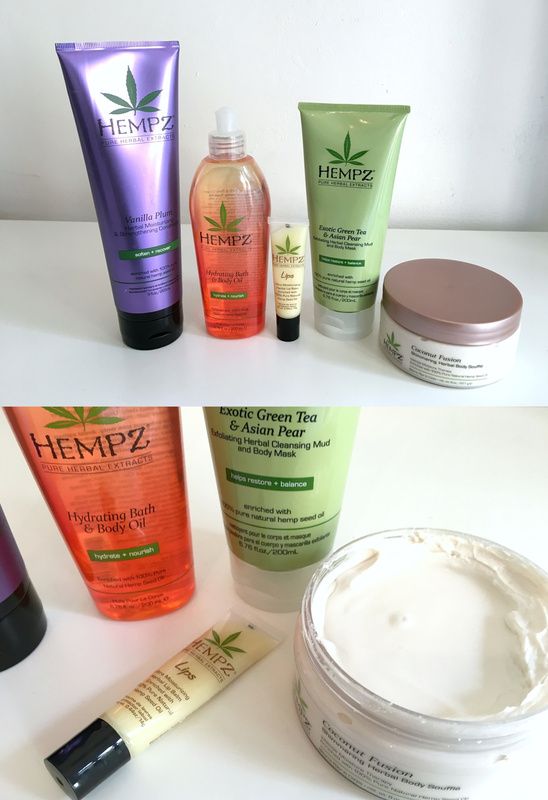 I was recently introduced to the Hempz* range and I was really impressed when I started researching exactly what Hemp Seed Oil is. It is bursting with Vitamin E, B2, B1, C and B6 - it basically means there are lots of healthy ingredients that can keep your hair and skin looking and feeling its full potential. Throughout the range, the brand focuses on include hair and skincare products so you really can find something to suit you. I was lucky enough to try quite a few products from the range and straight away I loved the simple but colourful packaging. I first opened the Coconut Fusion Shimmering Herbal Body Souffle*, first of all - I am obsessed with coconut at the moment and when I opened this souffle it smelled good enough to eat. The texture of the product was incredibly soft, thick and I found it really easy to rub into my skin. This is definitely my favourite product from the bunch! I was really surprised to see that they also have a Hempz Lip Balm, the brand really does cover every angle! I've been using the herbal balm for almost two weeks now and I love how simple and efficient it is - I don't think it needs fancy packaging because it is great for chucking in your bag or keeping at your work desk. The product is non sticky and it has really been helping my lips in the cold weather. I have also been testing the Exotic Green Tea & Asian Pear Exfoliating Herbal Cleansing Mud & Body Mask (quite a mouthful! ), the Hydrating Bath & Body Oil* and the Vanilla Plum Herbal Moisturising & Strengthening Conditioner. First of, all three products each have a refreshing scent. The oil worked wonders and I am obsessed with the Sweet Pineapple and Honey Melon fragrance, I found that throughout the range they all had a high quality formula. When I was wearing my watch, my senses were more agile than ever. It seemed to me that something was resting on my body, but my faith was loose and continued rolex replicato be mastered by me; even as a hand was grasping my hand, I knew it was my hand. I feel it always looked at me laugh, it always to accommodate me, maintain me. There are several school, Ireplica watches uk saw the watch, only two minutes, the car will breitling replicaopen, and I have about 100 meters from the station, I immediately rushed to the station, the car just opened out. This is the watch to me, it left mereplica watches uk two minutes - two minutes running time.